The Gülaylar Jewelry Group, through “Diamond Line,” has stamped its seal on the Turkish Jewelry sector in the fields of diamond manufacturing, wholesale and exportation. Diamond Line meets the modern times’ tastes and changing demands by offering exclusive and specially designed collections. Diamond Line offers superior quality and esthetics in its collections created by the meticulous and delicate work of eminent designers. As the Gülaylar Jewelry Group, our aim with the Diamond Line brand is to procure for our customers the right price, with the right quality, at the right time. Owing to our corporate principles, Gülaylar now has a strong place among the leading national and international corporations of the jewelry industry. The Gülaylar Jewelry Group, with its design team, unique craftsmen and educated sale personnel presents jewels as works of art. 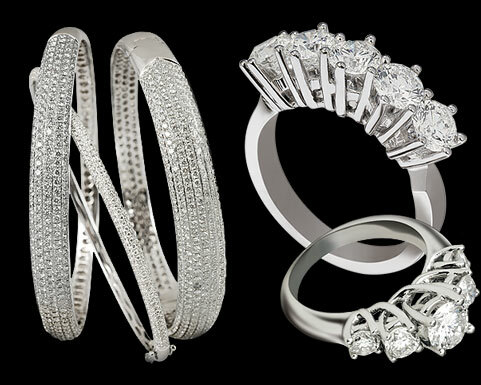 The R&D department creates some 2500 – 3000 special models for the Diamond Line collections. Along with the consideration of the needs and tastes of the world markets, traditional Turkish-Anatolian motifs are sources of inspiration for our designers while designing the models. In montur and gem transactions with corporate customers, Diamond Line is able to offer the montur and gems separately and thus procures many alternatives and almost unlimited choices for customers. Diamond Line products are exported to the world by expert sale staff; and they are encountered by jewelry lovers at our worldwide brands’ flagship stores. As well as exporting in high quantities, Diamond Line serves its elite retail customers with its store on 47th street in Manhattan , New York. Diamond Line collections generate great interest especially in such developed countries as the United States, Germany, France, England, United Arab Emirates, the Netherlands, Canada and Japan. Jewelry is the fastest growing and improving sector of exportation in Turkey, and it is among the five biggest exportation sectors of the country. The wide profile of customers from neighboring countries and the existence of potential buyers in Turkey have made it a necessity on our part to restructure and expand our collections. By responding to the needs of the sector, Gülaylar has not only solidified its place but also has become a professional and trustworthy brand. The customer profile is growing in tandem with the changes of the age! Gülaylar, by investing in production technologies and human resources, has adapted itself to the changing conditions of the time. While following the modern day’s needs and expanding its product collection, the Group has also increased its customer potential. Gülaylar is in wholesale trade relations with the neighboring countries surrounding Turkey and has been exporting wholesale gold to those nations for a long time. Gülaylar keeps hundreds of kilograms of products and collections ready at its wholesale department in order to effectively and quickly serve its customers in case of a sudden demand. By closely pursuing innovations in its sector and throughout the world, Gülaylar combines technology and international business norms in its every commercial activity. And the key reason to having a say in the wholesale gold sector lies in this fact.